Minion Sender provides an interface to send your minions on adventures. 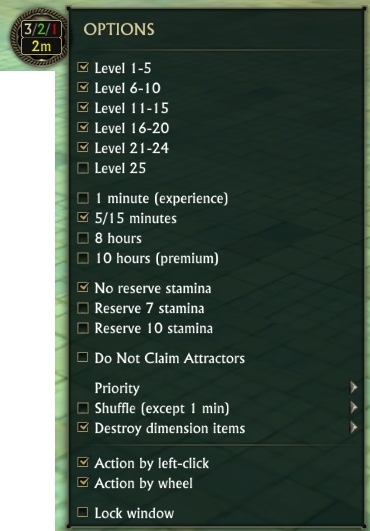 You can configure level of minions to send, select adventure type, reserve stamina and auto-destroy dimension items if you want. Options menu available by right-click on main window. 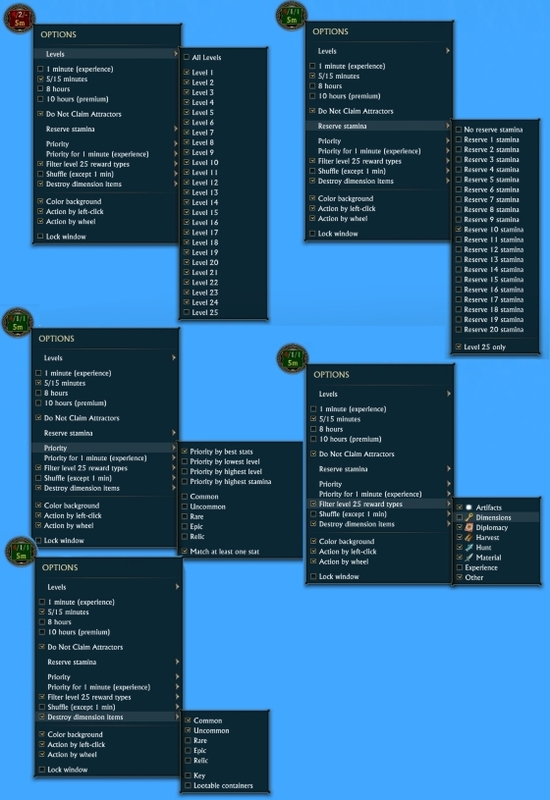 Action (send minion, claim reward, destroy dimension item) available by left-click on main-window. In the main window displayed following counters: available slots for minions / minions on adventures / completed adventures. When you send a minion in the adventure addon choose minion with the highest possible reward, ie minion with the largest sum of attributes matched with adventure attributes. "Hello, Thank you for contacting us regarding RIFT. I apologize for any confusion this issue may have caused. After reviewing our logs it appears these items are being automatically removed by your Minion Sender addon. Please disable this addon and let us know when you have so that we may go ahead and restore the items again. Again, I apologize for the confusion and understand the inconvenience this may have caused. If you have any additional questions or concerns, please don't hesitate to let us know. Thank you for your continued support of Trion Worlds and for playing RIFT. Your reference number for this ticket is **. My new option called "Do Not Claim Attractors" that skips finished adventures completed by Attractor minions. I have added a list of Attractor minion names to the language.lua file that may need to be updated for other languages if the minion names are different. The code has a spot for minion IDs of Attractor minions but we need to gather more of the minion ID values. I've noticed there's an adventure card that this addon chokes on, it's in the 5/15 deck, but it's a 1 minute card attracted by Doreen (there may be more, attracted by others) "Thin out thickets to find lost treasures"
My new option called "Do Not Claim Attractors" that skips finished adventures completed by Attractor minions. I have added a list of Attractor minion names to the language.lua file that may need to be updated for other languages if the minion names are different. Alternatively we could modify the code to use the minion IDs of Attractor minions if we can gather all of the minion ID values. Ok will try this new one out. Its been working great but did run into a small problem and not sure if its something that can be overcome. If you aren't paying attention when you get the triple quest missions(two missions unlocks third), like Lil' Reggie helps so and so, then you can deplete your minion and get stuck and have to shuffle. For example Little Reggie Helps Pyestorm requires you to send Little Reggie on a mission and leave him out until you get a pyrestorm mission and leave him out until you get the third mission. So if you claim the first before you get the second you will get the first again and if you are not paying attention it will run your first minion out of stamina. Anyways more of a paying attention thing, but if there was someway to alert the player that would be great. Doubled check to make sure I had reserve 10 stamina set and I did so not sure why it ran my Lil' Reggie out of stamina. I was playing an alt so I had it set to Priority Best Stats and Uncommon checked so it would use all my Green/Uncommon minions which are usually max stamina, but somehow it ran Lil' Reggie out of stamina repeating that special double/triple chain mission guessing the code for the chain overrides the code for the reserve 10 stamina? So far its working great for me, I'm past the less than 10 stamina missions so will let you know if I run into any problems. I did have to add .id to the end for the return minion to get it to work guessing that was a typo or copy/paste error. Also wasn't clear to me but I needed to leave the last End after return minion.id so now that entire function looks like this and appears to be working. Thanks for the great Addon! the button doesn't seem to be able to remember it's placement. I keep finding it in the middle of my screen when I log in, even though I had it up on the right before. First off awesome mod stealthdark, great work! If possible, I would like to request the ability to prioritize more level ranges in your official mod. I find it very helpful to send lower level minions on just experience runs, but then, once I deplete all my stamina on those minions move on to doing 5/15 missions on my higher level minions. I have modded my lua files to do this, but would like to request an official update to accomplish this. 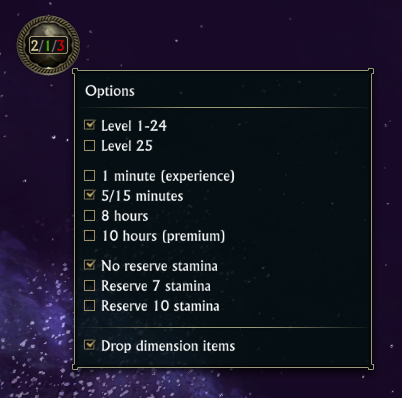 One thing you may keep the way it is, vs commenting out like I did, was the automatic selection of level25 parameter when you deselect level1, and vice versa. I found this was kind of a hindrance when you did not want either selected, since you have a larger level range. Thanks for your consideration Stealthdark. Here are the modifications I made to your script. I would love to be able to auto salvage artifacts as well, with the choice of common, uncommon etc. Any plans on integrating the "hurry" function?